Celebrating Thanksgiving with a senior can make the holiday even more special. While you are busy planning and preparing a festive meal, involve him or her in the holiday by helping your loved one create a crafty Thanksgiving centerpiece for the dinner table. 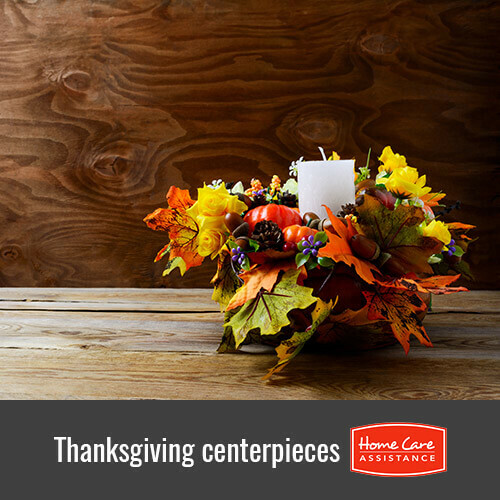 Oshkosh, WI, elder care providers recommend the following three festive centerpieces. Find a wooden half-crate that has a low profile. Have your love done draw or stencil the word “Thanks” on the side of the crate. Then, use a wood-burning tool to etch it in place. If you both are happy with the way that it looks, then you can leave it or add a stain to change the color. Fill the inside with a piece of Styrofoam. Stick beautiful fall flowers, fall leaves, gourds and miniature pumpkins on top of the Styrofoam until it is completely covered. Framed chalkboards make a beautiful simple Thanksgiving centerpieces that most seniors can easily complete with help from you or an Oshkosh, WI, part-time caregiver. Start by finding two framed chalkboards. If you do not like the color of the frame, then look for wooden ones and give them a quick coat of paint. Drill some holes in the top of the frame and use some wire to connect them to form a simple easel. Write the word “Thanks” on each one. You can position these in the middle of the table. Make your centerpiece even more festive by adding miniature pumpkins or gourds in front of it. Leaf lanterns make a beautiful addition to Thanksgiving tables, but they are also easy to make. Start by collecting some beautiful fall leaves. Find an old jar and measure its circumference. Cut a piece of wax paper the same height as the jar and twice its circumference. Lay the wax paper on a table so that the waxy side is facing up. Arrange the leaves on one half of the long side of the wax paper. Fold the wax paper in half and hold a hot iron on top of it for just a few seconds allowing the wax to melt. Cover the outside of the jar with the wax paper gluing it in place. You can tie raffia around the top of the jar to hide the end of the wax paper. Place a tealight candle in the jar for a beautiful centerpiece. These look especially elegant placed on top of a glass mirror. Creating Thanksgiving centerpieces with seniors need not be time consuming or expensive. You will be building memories that last a lifetime. Even if the project does not turn out perfect, you will love the experience of spending time together. Learn more about ways to engage with your senior loved one today by calling Home Care Assistance of Oshkosh at (920) 710-2273 today. We provide flexible Oshkosh, WI, dementia, Alzheimer’s and stroke care that enables seniors to lead active social lives while boosting overall wellbeing. Call today to schedule a free consultation.